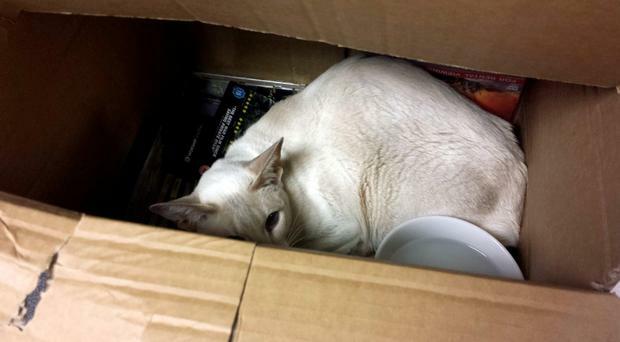 A Siamese cat survived eight days in a box after she was accidentally put in the post by her owners. Cupcake travelled with an order of DVDs from Falmouth in Cornwall to West Sussex - more than 260 miles away. Her owners sealed and posted the parcel two weeks ago, with it arriving safely at its destination eight days later. The recipient was stunned to discover Cupcake, who was extremely dehydrated, inside the box along with the DVDs. They contacted the RSPCA who collected the cat and took her to Grove Lodge Vets in Worthing for a health check. Cupcake's owner, Julie Baggott, later travelled there from Falmouth to be reunited with the cat. "When I realised she was missing two weeks ago it was the most horrible, scary feeling," she told the BBC. "We looked everywhere for her. I feel terrible about what's happened. "I put everything in the box and sealed it straight away so I don't know how she managed to get in there. "It was a miracle because she was alive and she's managed to survive that awful ordeal." Grove Lodge Vets said they would never have been able to reunite Cupcake with her owners if she had not been microchipped. "We scanned this gorgeous girl to check for a microchip," they said. "Everyone was delighted and even more so when we found that the contact details were up to date and we were able to contact her owners straight away. "They had been frantically searching for their beloved cat, putting up posters in the local area but not for one second realising that she had been accidentally posted to an address in West Sussex, more than 260 miles away. "This is probably one of the most extraordinary stories any of us at Grove Lodge Vets has ever heard. "The serious side of this incredible journey is that poor Cupcake was extremely dehydrated and has required intensive treatment to ensure she recovers fully." The vets said Cupcake had seemed "quite relaxed and unconcerned" while waiting for her owners in her kennel on the cat ward. RSPCA inspector Julie Parsons said: "Poor Cupcake was very lucky to survive. "When I arrived she was very weak and fragile. She had been trapped in the box for around eight days and was in a dehydrated and very hungry state. "Luckily, she made a quick recovery, and had been microchipped so I was able to scan her and track her owners down. "I couldn't believe it when I found out they were all the way down in Cornwall - what a distance! A proper travelling cat. I never would have thought of putting a 'Pet Found' poster up down there. "It just goes to show how important it is to microchip your pets, and keep the details updated. Without this there is no way I would have known where she came from and her owners might still be frantically searching for her."